Our price of tub reglazing starts from usually the $300 range as opposed to $3000 of replacing. Reglazing is 10% the price of replacing! And your tub will look like it's new! 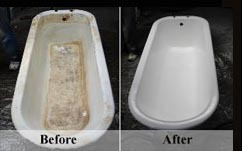 When we reglaze your bathtub and/or tiles we fill any scratches, dents, divets or "poc" marks before we apply our materials so the result is that your tubs looks like new. We provide bathtub reglazing and tile refinishing services for Toronto and surrounding GTA that will be ready for you to use in as early as 12hrs! Our non toxic arcylic material provides a brilliant long lasting and durable shine that is guaranteed for three years. Also for your functional plumbing needs in Toronto and surrounding areas, we provide the service of toilet, faucet and fixtures installations and reconfiguring the drainage for newly installed over- sized sinks. WE DO NOT SIMPLY PAINT OVER THE PROBLEM! You may also be considering a drop in tub liner that you are not likely to be happy with. • Long lasting quick fixtures. Refinishing your bathroom tub or tile is the better alternative to replacing it. Refinishing provides you with like new results. Cracks, chips and divets are seemlessly filled.